in many styles of yoga. The name comes from the Sanskrit words janu (जानु, jānu) meaning “knee”, shirsha (शीर्ष, Śīrṣa) meaning “head”, and asana (आसन) meaning “posture” or “seat”. Although it bears a similar name, Janu Sirsanana bears little resemblance to Sirsasana (Headstand). the foot in by the groin. 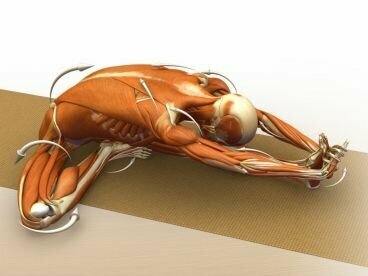 The torso turns and folds over the extended leg. Janu Sirsasana differs from Paschimottanasana in its asymmetry in the legs and hips, and in the twisting action this asana imparts to the spine. Parivrtta Janu Sirsasana (Revolved Head-to-Knee Pose) begins in the same seated leg position as Janu Sirsanana, but with the torso revolved to face toward the bent leg, then bending sideways over the straight leg. Janu Sirsasana B is set up the same as Janu Sirsasana (also known as “Janu Sirsasana A”) but with the foot of the bent leg placed under the thigh of the straight leg. 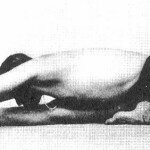 Janu Sirsasana C is set up the same as Janu Sirsasana A, but with the foot of the bent leg turned so that the heel points upward and the toes press down into the earth. Strengthening and Stretching the shoulders, spine, groins, and hamstrings. Stimulating the liver and kidneys. Relieving stress, anxiety, fatigue, headache, menstrual discomfort, the symptoms of menopause. Therapeutic for high blood pressure, insomnia, and sinusitis.